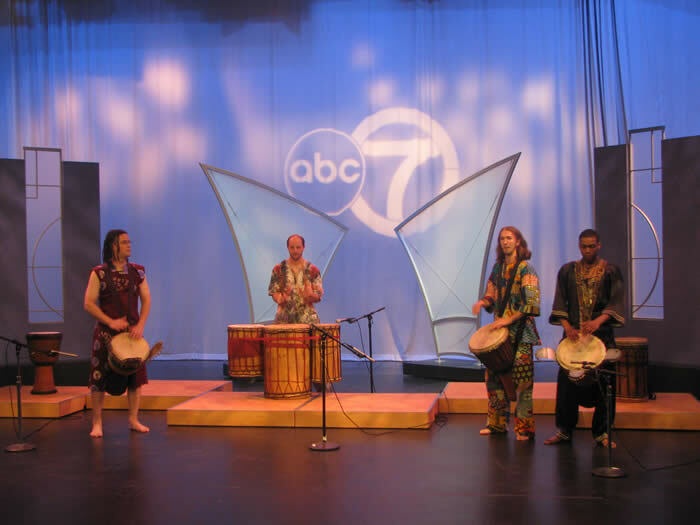 The name Kaben Kafo (“let’s play together” in the Malinke language, spoken in Guinea, West Africa) was gifted to me by djembe guru Grand Master Drummer Mamady Keita, from Guinea, West Africa. I was telling him about a new ensemble that I was to putting together, focusing on going deeper into traditional repertoire and that it needed a name. Kaben Kafo is a djembe ensemble comprised of some of Chicago’s most studied and gifted djembe/dunun professionals, getting together to breathe deeply with the intricacies, complexities and depth that is part of the deeper recesses of djembe music. Members of the current ensemble include Taylor (djembe/dununs/flute), Kris Sanders (djembe/dununs), Eric Thomas (djembe/dununs) and(not pictured on vieo) – Jason ‘Wolfy’ Wolf (dununs), Andrew Ebert (djembe/dununs), Greg Lundberg (dununs/djembe) and, when the drum-planets align, sometimes we have some extra special guests – Master Drummer Alysco Diabate, Master Drummer Madou Dembele.